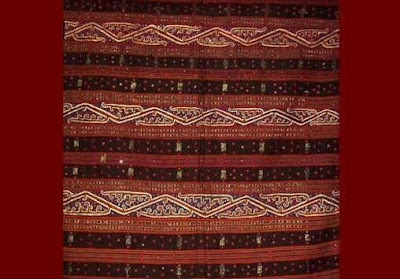 Tapis cloth, a dress for women of Lampung tribe, is a sarong made from cotton yarn with motive or ornament from tobacco quid, silver or golden thread with embroidery system (Cucuk). Tapis of Lampung is considered as traditional handicraft because the basic cloth and it`s motives ornament is done by the traditional weaver with simple tools. This handicraft was made by women, both the housewives and girls (muli-muli) in their leisure time to comply the demand of the sacred tradition of the Lampung people. Nowadays, by using the non-machinery equipment, the production of Tapis cloth with various ornaments has become a high economic commodity. The stores clothes is located in the central of Lampung City.